1) A10 Direct Cable (66268-03) – The Plantronics 66268-03 A10 direct connect solution offers extremely clear sound quality and superior reliability, the A10 cable will usually say “A10-16” right on the quick disconnect plug. The A10 cable allows you to easily connect a Plantronics H-series headset to most headset-ready phones, via the built-in dedicated headset jack on the telephone.The A10 cable (66268-02) replaced the Polaris cable (27190-01) for most “Polaris” applications. The A10 model numbers 66268-02 and 66268-03 are the same cable, the “-03” is the current model. When a cable (A10/Polaris) is installed into the headset port of some phones (For Example: Nortel T7316), the handset/speakerphone will be disabled due to the design of the phone. The phone may be programmed to prevent this.The A10 cable should not be used if the compatibility guide calls for HIS, HIC, HIP, or 26716-01 amplifier / Cisco cable with an H-series headset. Otherwise using an H-series headset with the A10 cable is equivalent to a Polaris solution. 2) Amplifier / Cisco Direct Connect Cord (26716-01) – The Plantronics 26716-01 amplifier / Cisco direct connect cable. The 26716-01 is the standard cable that comes with and is used on the Plantronics MX10, M10, M12, and M22amplifiers.The 26716-01 coiled cable connects any H-Series headset with a Quick-Disconnect plug to a compatible Plantronics amplifier, or telephones that have a compatible headset jack. Typically the compatible telephones are the Cisco 7940, 7960, and 7970 models, also a few Avaya phone models as well. 3) HL10 – The Plantronics HL10 Handset Lifter is a must-have addition to your Plantronics wireless headset system; it’s a great product if you are always answering phone calls away from your desk. The HL10 handset lifter fits on your telephone via double-sided tape, and allows you to answer calls with just the touch of a button on the headset, conveniently and automatically takes your handset “off hook”. Because the HL10 fits under the handset on your telephone, it requires no additional space on your desk. The HL10 Handset Lifter will raise and lower the top half of the telephone’s handset receiver so you don’t need to be at your desk to answer the phone, or to hang up (compatible with most telephones).Enjoy the full mobility of wireless conversations while you roam around your workspace knowing that you’ll be notified when a call is received, the headset will beep in your ear when you have an incoming call (for most telephones) and you can answer / end a call whenever you choose. 4) 40709-02 – The Plantronics 40709-02 doughnut-style ear cushions are the replacement foam ear cushions for the Plantronics SupraPlus headset models. The 40709-02 are the standard foam ear cushions that come with certain corded headsets, such as models H251, H251N, H261, H261N, HW251, HW251N, HW261, HW261N, and other models that are in the Plantronics SupraPlus corded headset line. Optional leatherette doughnut ear cushions can be purchased for the SupraPlus corded headsets as well (model 67712-01) The leatherette ear cushions are typically more durable because you can clean them. 5) 72442-01 – The Plantronics 72442-41HIS direct connect cable with Quick Disconnect, for connecting Plantronics H-series corded headsets directly to specific Avaya phone models.Take advantage of the full wideband audio that is offered with the 9600 model Avaya telephones when using the “HIS” cable and a Plantronics wideband headset, such as the HW291N. 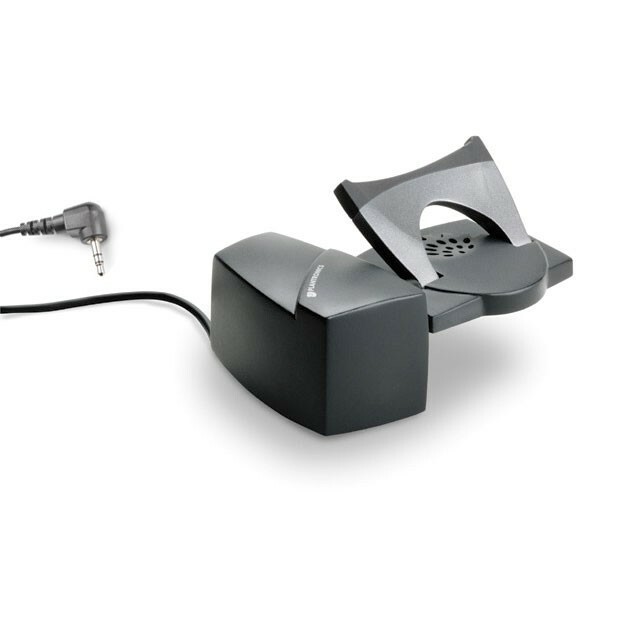 The Quick Disconnect (QD) plug allows the headset to unplug from the HIS bottom cable without losing the phone call.